Welcome to the Holiday Expressions Blog Hop! 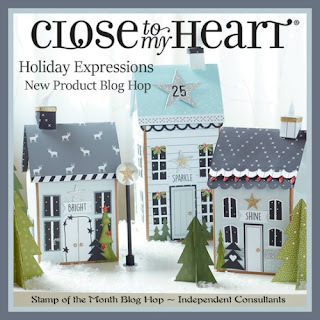 Today we are sharing lots of festive fun from the new CTMH Holiday Expressions book. You may be arriving here from SHEILA'S BLOG, and you can find a full list of participants here. Today I decided to make a quick little holiday card to try out some of my fun new Beary Christmas goodies. The bear image is from Beary Christmas - Scrapbooking, and the matching Thin Cut Dies make these dudes so much fun to color! I was working from this week's CAS(E) This Sketch challenge. 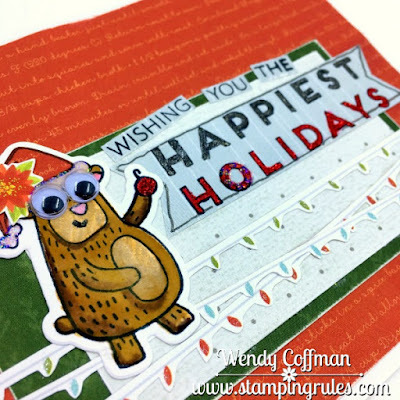 Instead of adding a strip of paper or shimmer trim, I chose to fussy cut some of the string lights from one of the Beary Christmas prints to criss-cross my card. I also fussy cut the poinsettia on his paper pieced hat from anther Beary Christmas print. The sentiment is from Gingerbread Friends, and I went over the letters with both glitter gel and my Spica pen. I added some extra big wiggly eyes to our little bear friend and drew on a little smile. Finally, I made good use of my shimmer brush on all the lights and his sweet pink nose. Next up on the hop is MICHELE'S BLOG. Happy hopping! How much fun is this card. Love it. That will be a fun card to get in the mail! Cute! Delightful card! love all the details. The details make this card so much fun. Just adorable.